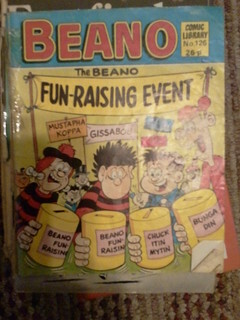 The Beano comic first appeared on 30 July 1938 which means it has reached the grand old age of 75 and still going strong. It’s cartoon strips have stood the test of time. In fact cartoons appeal to people of all ages, even those old enough to be looking for a stair lift. Look here for proof. While it has changed over the years some of its iconic characters still appear on its pages. How could you publish the Beano without Dennis the Menace, Minnie the Minx, The Bash Street Kids, Roger the Dodger, Billy Whizz and Ball Boy? There are only 12 known copies of the very first edition of the comic in existence and one of these sold at auction for more than £12,000 in 2004. This was the highest price ever paid for a comic at auction. It didn’t hold the title for long as its sister – or should that be brother – comic, The Dandy was auctioned 6 months later raising more than £20,000 for a first edition. Many changes and various revamps have happened along the way. The 60th birthday issue was a huge 40 pages long and was guest edited by Wallace and Grommit. The 70th birthday saw a brief history of the comic published. What will they do this year? Well the birthday issue came out earlier this week with lots of celebrities featuring alongside regular strips. David Beckham and Sir Alex Ferguson, Andy Murray, Simon Cowell who gets pelted with eggs and the latest 007, Daniel Craig. Harry Hill and Sir Bruce Forsyth also make appearances. There is one person who is very happy to see another Beano milestone. The oldest member of the Beano Fan Club Jim Andison. Jim is 91.5 years old! He is a regular Beano reader and telephone caller to the Beano’s head office in Dundee offering suggestions to the publishers D C Thompson. He’s so well known to them that they invited him to the offices on his 91st birthday and made him a personalised card. His wife May says, “He is obsessed with The Beano. It’s just him, he enjoys it. He’s Dennis the Menace at heart!” The Beano’s editor Michael Stirling has nothing but compliments for the comic’s biggest fan and acknowledges that it was probably the art work that first attracted Jim to the comic. Fancy trying your hand at drawing or even animation? The University of the Third Age offers a variety of courses in different areas. Check them out in yours. Or you could see what’s on offer on at the Open College of the Arts who offer home study courses. Here’s a video about them. Of course your local college may also run art or animation courses too. It’s all good for us. Keeping mind and body active in a variety of ways is just as beneficial to us as we age, as it is when we’re younger. If you fancy creating some cartoons for our sister website stairliftcartoons.com then get in touch via the contact page.